This post, although sponsored, brings me to a time when I had to teach each and every pack member the ways of the potty-trained warrior. As pup-parents, although not as difficult as child parenting, we have our ups and down when it comes to housebreaking, sticking to a routine, and ensuring that our dogs grow into good citizens. I do hope new pawrents get to read this post or our ancient post on the 5 "S" of Potty Training. House training a young pup can be relatively easy, or a complete and utter nightmare, depending on the individual dog. Some puppies seem to “get it” fairly quickly while others can leave you tearing your hair out! How well you, as owner, are trained in potty training techniques is another factor determining how quickly your dog learns. Make life easier for you and your pooch by reading up on these potty training essentials. 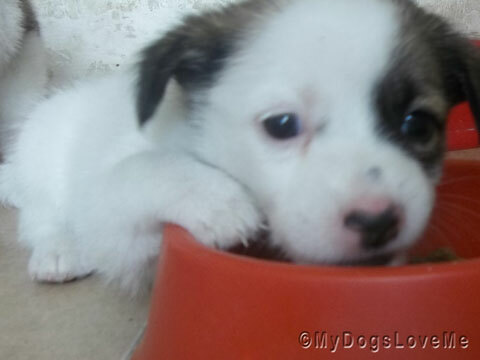 Feed your pup the same amount of food at the same times of the day and have him eat it in the same place. Whatever you do, don't leave food out for a puppy to eat when he feels like it. A puppy processes food really quickly and will usually need to defecate anywhere between 5 and 30 minutes after eating. So sticking to a routine is obviously going to help you lots when it comes to anticipating when he needs to go. Puppies eat (like all other living things)... Use this to your advantage to anticipate their "potty" move. If you live somewhere with easy access to outside, then this area should definitely be outdoors. If not, then it may be a bathroom or laundry. During at least the first month of potty training be prepared to pick up your puppy and carry them to the designated toilet area to go potty following every meal. You should also do this immediately upon your pup waking up from a nap, immediately following a big drink of water, after they've been playing hard, if they whine during the night or in their pen during the day, as well as if they stand by the door to outside. Remember, a pup usually “goes” about every 45 minutes, so make sure you're around to anticipate this and prevent mistakes. When he goes in the right place, a reward should be in store. This doesn't have to be anything over the top, just a positive reaction and perhaps a small treat will do. Don't ever punish a pup for a “mistake”. Remember, puppies are never fully potty trained until they are at least six months old. Mistakes will happen. Just clean up, without displaying any negative reaction. If your pup begins a wee and you spot him doing so, you can sometimes interrupt it by moving towards him quickly, and startling him – but definitely not scaring him! Sweep him up into your arms and rush outside to the designated spot, and he will hopefully finish the wee there. NB. Don't try this with a poop, as puppies cannot stop themselves mid-poop - you will simply end up with a much worse mess to clean up! Just prior to your going to bed, ALWAYS go get your pup and take him to the potty area. Doesn't matter if he's asleep or not, make sure to take him to the designated spot every single night. Same goes for first thing in the morning. Tips from the team at Spoiltrottendogs.com.au, specialist dog carers. There is a lot for humans to learn!! I'm not sure, but I feel like with your simple tips, it's much easier potty training your dog than your child!The tips about moving your dog will really help.